I love a good DIY project, and most of the time when I get an idea for them I’m starting with inspiration for what the end product is going to look like. Every once in a while though, my inspiration comes from the actual materials I’m working with. An interesting material can spark the thought, “hmm, what can I make with this?” – and that’s exactly how this DIY project started. 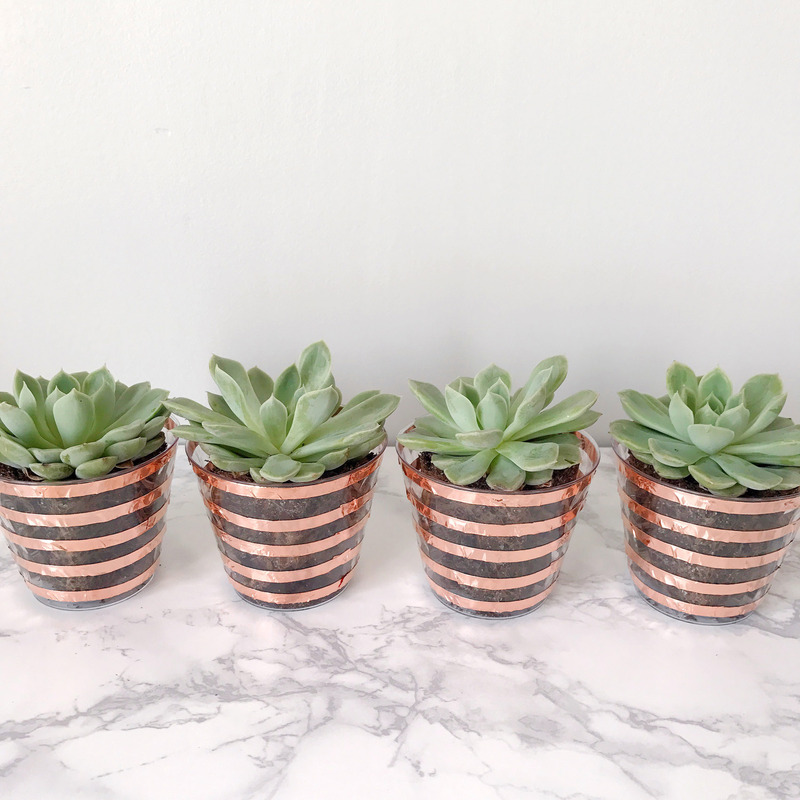 The hardware store can be a treasure trove of project material inspiration, and when I found some shiny copper electrical tape there I knew I had to use it as a starting point for something crafty. 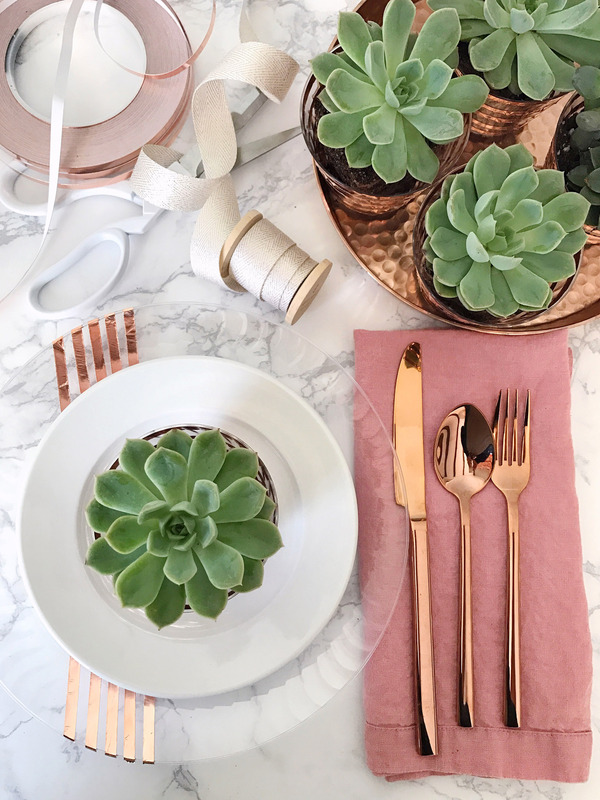 Copper is such a hot trend right now, and that warm metallic tone can be a fun touch to add to any tablescape. 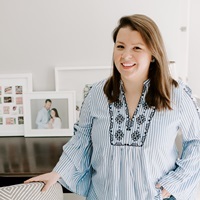 I decided to use it to bring in a metallic element to some Chinet® Cut Crystal® plates and cups, which have a clear, Lucite look to them for a modern feel – perfect for a hip bridal shower or birthday luncheon. 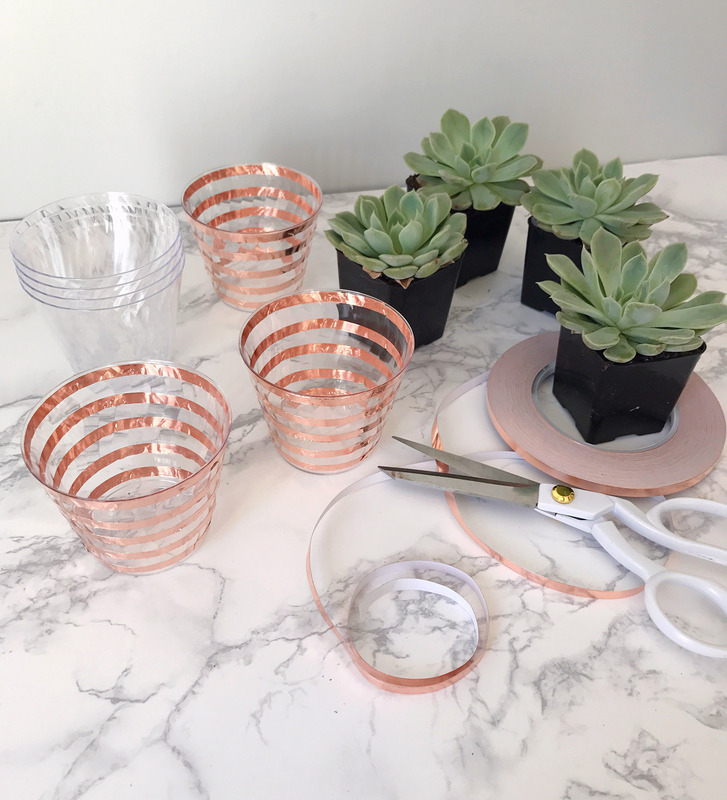 The copper tape is fun to work with; it has the flexibility of a sheet of aluminum foil, so it can bend and wrap over tons of surfaces. I started to use it by wrapping it around some of the Chinet Cut Crystal cups in a striped pattern (to get the stripes evenly spaced, I pre-marked them out with a ruler and a few dots with a permanent marker to help guide my tape). 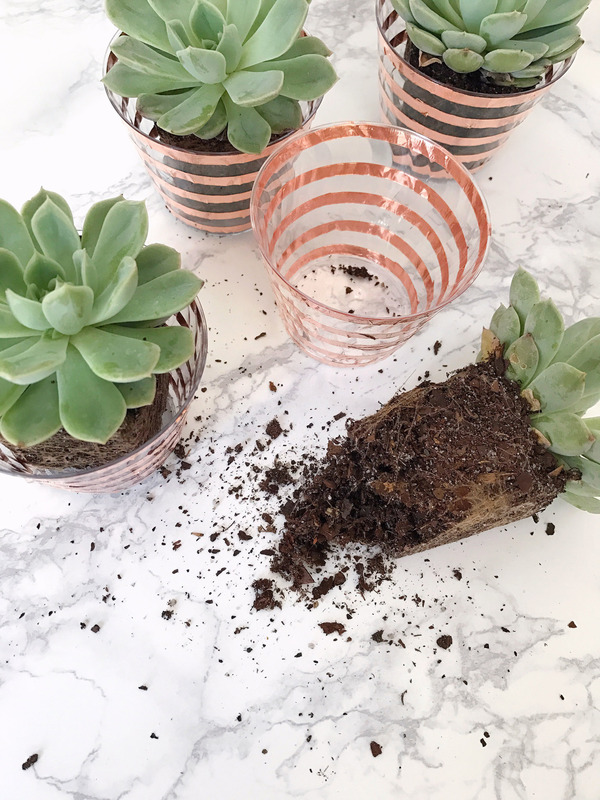 Once the cups were decorated with the copper stripes, I used them to pot a few succulent plants. 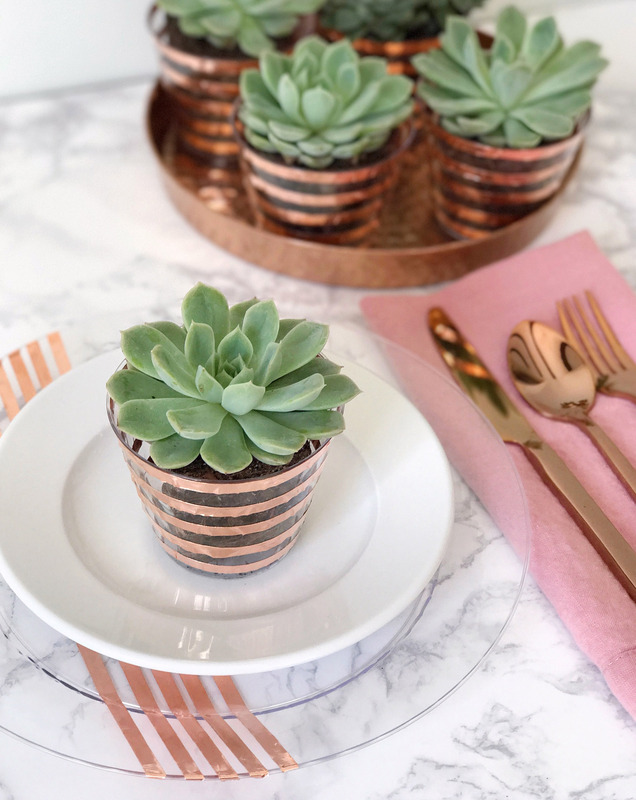 The succulents do double duty on a tablescape; I’ve used them before as both table décor for a baby shower, and then gift them as favors at the end of the party. Adding little flags to the potted plants with guests’ names is another great way to use them as place cards for a seated event. 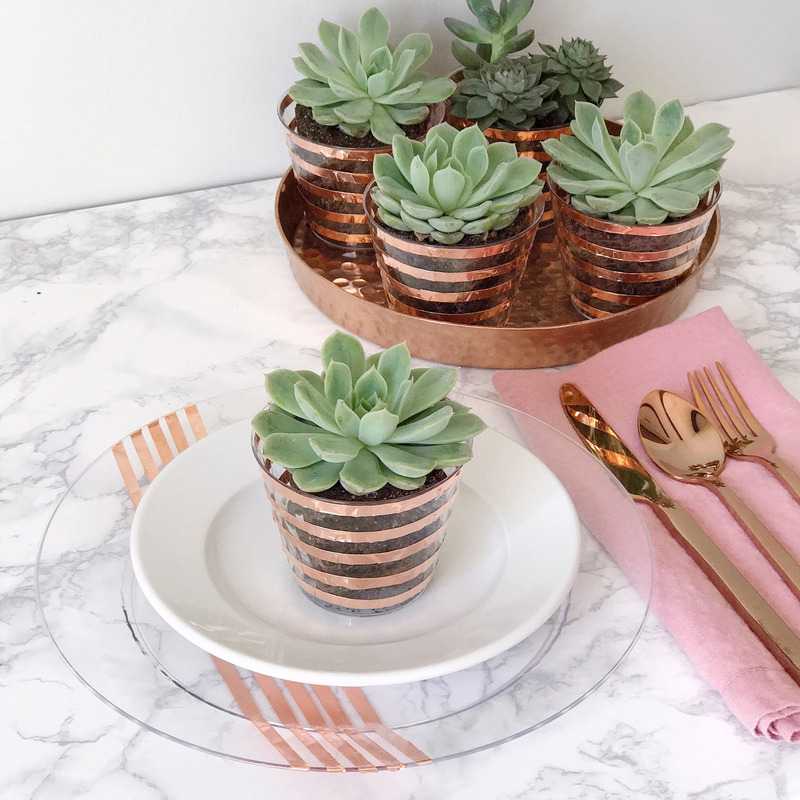 Another way I used the copper tape to bring in a graphic, modern element to a tablescape is by adding it in stripes to Chinet Cut Crystal dinner plates. I tucked the plates under another clean white dish and used them as chargers with that fun, metallic stripe popping through. 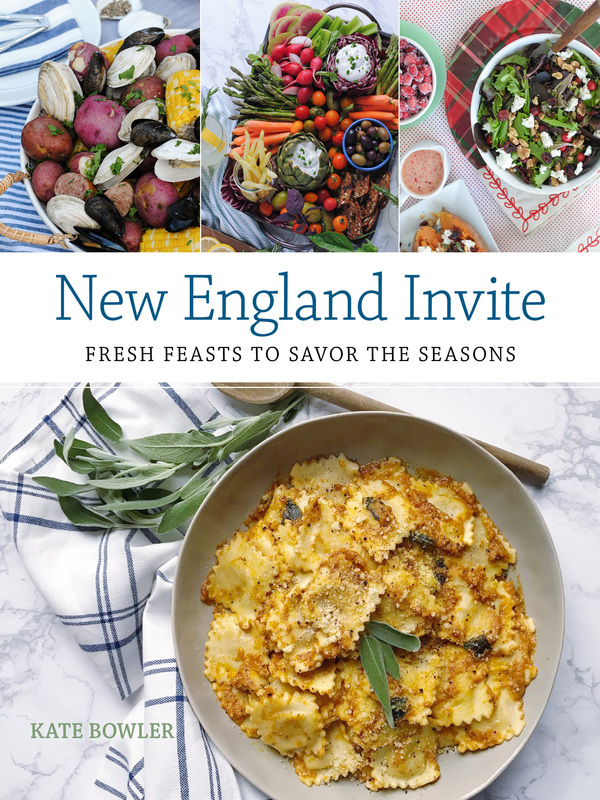 I love that you can see the table through the plates, and the metallic stripes shining on top of the layered place setting. The possibilities for this simple material are endless, I have been thinking about adding it around plain wooden napkin rings, clear vases, or to dress up paper menus and place cards for a clean, modern and geometric metallic element for any type of event! Awards Show Caramel Popcorn Sundaes. Homemade Chocolate Peanut Butter Granola Bars. 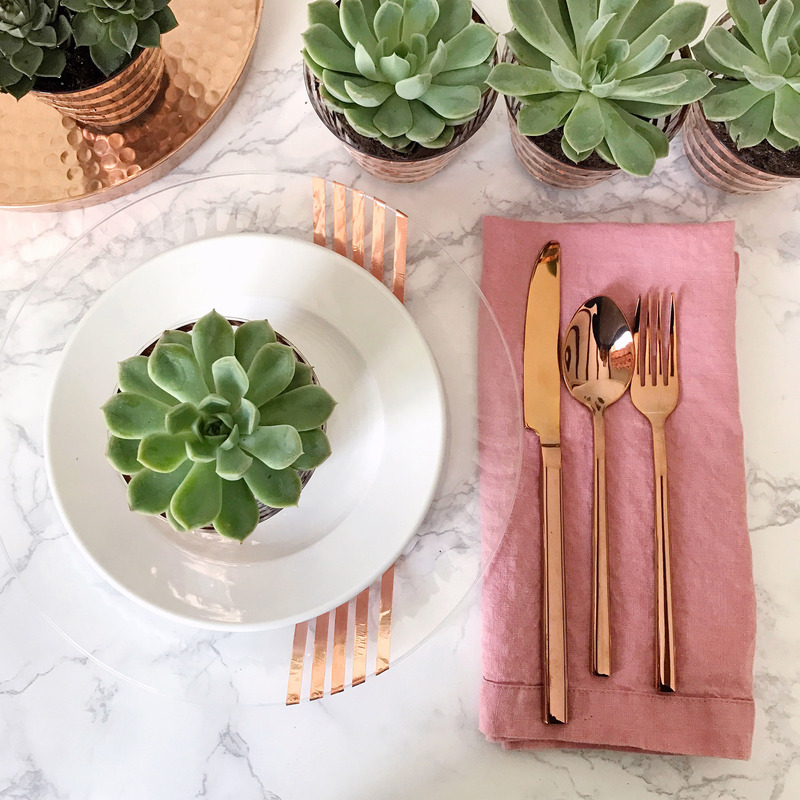 One Response to "Modern Metallic Tablescape DIYs."